Gerritt Thurston and Kullan Edberg in The Tutors. BOTTOM LINE: An intriguing plotline and unique characters, along with strong performances from the cast, make this worth seeing. The saying "life is what happens when you’re busy making plans" certainly seems applicable in the play The Tutors, which focuses on three college friends who are stuck finding professional and sexual substitutions when nothing in life seems to be going their way. The play takes place in 2007 when Facebook was still relatively new and MySpace was still popular. The trio had dreamed of becoming millionaires by launching their own social media site JoinMe2U, only to find themselves unable to keep up with the work and find a strong user base. 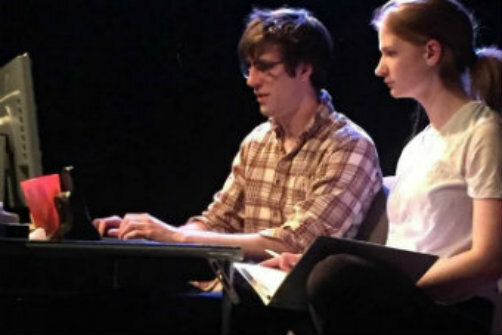 The friends try to make ends meet in the meantime by becoming tutors: Toby (Gerritt Thurston) and Joe (Dan Gonon) tutor the lazy and unmotivated offspring of the wealthy while Heidi (Kullan Edberg) helps to revise the college admissions essays of would-be students she solicits online. When the two aren’t rewriting the essays of others, they hunch over their computers watching their dream fail to take off. Toby and Joe are stuck dealing with bratty and unmotivated student Milo (Michael Greehan). While Milo first seems to be bent on torturing the two of them, he soon shows himself to be a loner in need of friendship and social interaction. Heidi meanwhile has become so fed up with the outside world that she has not left the apartment in a month and has given up on bathing and changing out of her pajamas. When she isn’t furiously revising essays she imagines romantically and erotically charged scenarios with Kwan (Sean Devare), a business student from Hong Kong whose admissions essay to Columbia left her smitten. As the tension over improving their lackluster site discourages Toby, Joe (despite being straight) offers himself up as a sexual distraction, a decision that later tears the friendship apart. The Tutors is an intriguing play, rife with unusual characters and situations that feel different from the usual storylines that play out on theatrical stages. The strong performances of the central cast members emphasize the emotional tensions and dramatic moments that unfold, particularly Kullan Edberg (previously seen in Battalion Theater’s production of The Drunken City) who captures her character’s emotional crisis fully as a girl who has given up on the outside world and makes the more unbelievable scenes in the production feel more convincing. Lipez’s script doesn’t, for the most part, overdo the dramatic moments and instead shows how misunderstandings and vulnerability between friends can create destructive situations. In the end, The Tutors shows us a world full of disconnection due to the heightened reliance on technology: where dreams and real relationships have been replaced with keyboards and screens, leaving us lonelier than ever.